• WHAT’S THE NEWS: T-Mobile joins Puget Sound Energy's "Green Direct" program to power its Bellevue HQ with 100% renewable energy by 2021 and receives industry accolades for its clean energy leadership from the EPA and CRS. • WHY IT MATTERS: PSE’s Green Direct represents yet another step toward T-Mobile’s RE100 commitment to use 100% green energy by 2021. Plus, leading environmental organizations including the Environmental Protection Agency and Center for Resource Solutions recognize the Un-carrier as an industry leader and innovator for green power. • WHO IT'S FOR: Anyone interested in companies who are stepping up and taking responsibility to protect our people and planet. BELLEVUE, Wash., Oct. 16 /CSRwire/ - And America’s Un-carrier is crushing it on the environmental front, too. T-Mobile (NASDAQ: TMUS) today announced it has signed on to Puget Sound Energy’s (PSE) Green Direct program, giving the company access to a blend of local wind and solar renewable energy sources, which will be used to power its Bellevue, Wash., headquarters with 100% renewable energy by 2021. This move will help the Un-carrier save millions of dollars in energy costs, while also putting it one step closer to its RE100 clean energy commitment to use 100% renewable energy across the entire company by 2021. T-Mobile is the only wireless company to be approved by the Washington Utilities and Transportation Commission in the second round of offerings for PSE’s Green Direct program. With Green Direct, T-Mobile will purchase clean energy from dedicated local wind and solar energy resources, with the solar project being the largest ever built in the state of Washington. As the company pushed forward with its already-strong commitment to renewables, it was also recognized by both the Environmental Protection Agency (EPA) and Center for Resource Solutions (CRS) for its industry-leading green energy initiatives. “T-Mobile’s choosing green power because it makes sense for the planet and for our customers — plus it's helping grow America’s green energy market big-time,” said Legere. “I'm incredibly proud of our team for earning recognition for their hard work -- but there's lots more to be done and you can be sure, we won't stop!" 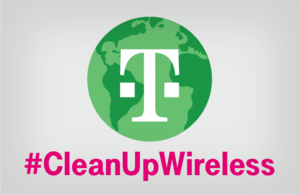 For more information on TMO’s Sustainability efforts, visit: www.t-mobile.com/responsibility/sustainability.